PMR’ recent market study titled “Atherectomy Devices Market: Global Industry Analysis 2013–2017 and Forecast 2018–2026” comprises a comprehensive assessment of the key market dynamics. On conducting a thorough research on the historic as well as current growth parameters of the atherectomy devices market, growth prospects of the atherectomy devices market have been obtained with maximum precision. The report features unique and salient factors that are likely to have a significant impact on the development of the atherectomy devices market during the forecast period. These factors can help market players modify their manufacturing and marketing strategies to envisage maximum growth in the atherectomy devices market in the coming years. The report provides detailed information about the current and future growth prospects of the atherectomy devices market in the most comprehensive way for the better understanding of readers. The report commences with the executive summary of the atherectomy devices market, which includes the summary of key findings and statistics. It also includes the market value (US$ million) estimates of the prominent segments of the atherectomy devices market. Readers can find detailed taxonomy and definitions pertaining to the atherectomy devices market in this chapter, which will help them understand the basic information about market dynamics, company share, cost structure, pricing analysis, list of key distributors and suppliers, list of key market participants in the atherectomy devices market included in the report. This chapter includes a detailed analysis of the growth of the North America atherectomy devices market along with a country-wise assessment for the U.S. and Canada. Readers can also find information on the regional trends in the atherectomy devices market, along with regulations and company share analysis along with market growth on the basis of device type, indication, end user and country. Readers can find detailed information about factors such as atherectomy devices pricing analysis, and regional trends that are impacting the growth of the Latin America atherectomy devices market. This chapter also includes the growth prospects of the atherectomy devices market in prominent LATAM countries such as Brazil, Mexico and the Rest of Latin America. Important growth prospects of the atherectomy devices market based on device type, indication and end user in several European countries, such as Germany, the U.K., France, Italy, Spain, Russia and the rest of Europe have been included in this chapter. India, Australia and New Zealand, Japan and China are the prominent regions in the APAC market. Thus, they are the prime subject of assessment to obtain growth prospects of the APAC atherectomy devices market. In this chapter, readers can find thorough information about the growth parameters of the APAC atherectomy devices market for the period 2018–2026. This chapter provides information on how the atherectomy devices market is expected to grow in major countries of the MEA region, such as GCC Countries and South Africa, during the period 2018–2026. Readers can find important factors that are estimated to have a significant impact on the growth of the atherectomy devices market in MEA during the forecast period. This chapter also provides an overview of the regulations, drivers, restraints and trends prevalent in the MEA atherectomy devices market. In this chapter, readers can find a comprehensive list of all the leading stakeholders in the atherectomy devices market along with detailed information about each company, including company overview, revenue shares, strategic overview, and recent company developments. Market players featured in the atherectomy devices report include Boston Scientific Corporation, Avinger, Inc., Cardiovascular Systems, Inc., Medtronic and Royal Philips. This chapter explains how the atherectomy devices market is expected to grow across various geographic regions, such as North America, Latin America, Europe, Asia-Pacific (APAC) and the Middle East & Africa (MEA). Based on the device type, the atherectomy devices market has been segmented into rotational atherectomy devices, directional atherectomy devices, orbital atherectomy devices and laser ablation atherectomy devices. In this chapter, readers can find information about key trends and developments in the atherectomy devices market and market attractive analysis based on the device type for each region. Based on the indication, the atherectomy devices market has been segmented into coronary artery diseases and peripheral artery diseases. In this chapter, readers can find information about the disease epidemiology for each of the two indications and developments in the atherectomy devices market and market attractive analysis based on indication for each region. Based on the end user, the atherectomy devices market has been segmented into hospitals, ambulatory surgical centers and office-based labs (OBL). In this chapter, readers can find information about the key trends and developments in the atherectomy devices market and market attractive analysis based on end user for each region. This chapter helps readers understand the research methodology followed to obtain various conclusions, important qualitative information, and quantitative information about the atherectomy devices market. The atherectomy devices market is primarily dominated by the leading manufactures of the oral care industry. The advanced technology associated nature of the atherectomy devices market offers lucrative business opportunities for the market players that are planning to introduce technologically advanced atherectomy devices. Key players, such as Boston Scientific Corporation, Avinger, Inc., Cardiovascular Systems, Inc., Medtronic and Philips, account for a revenue share of more than 98% of the global atherectomy devices market. Furthermore, increasing partnerships between the key players operating in the atherectomy devices market and international distributors is estimated to boost the penetration of atherectomy devices. The increasing demand from developed regions has resulted in the concentration of the atherectomy devices in these regions. The U.S. is a major regional market and accounts for a large number of atherectomy procedures. Key players in the atherectomy devices market, such as Cardiovascular Systems Inc., have a major hold on the U.S. market. The company has a major presence in the U.S. alone, and generates approximately US$ 188.00 million worth of revenue through the sales of orbital atherectomy systems. Moreover, the company holds a monopoly in the orbital atherectomy segment. Key players in the atherectomy products market offer a large portfolio of products in developed regions. The demand in developed regions is fuelled by the growing awareness about atherectomy procedures and Peripheral Artery Diseases (PADs). There has been a noticeable rise in the number of patients suffering from arthrosclerosis, diabetes and obesity. The number of patients undergoing angioplasty, interventions and catheterisation for reducing Arterial Plaque (AP) has been on a consistent rise. Hence, the presence of a large target patient pool suffering from Peripheral Artery Diseases (PAD) and patients that require central vascular access in ICUs, outpatients, CathLabs and operation theatres is projected to present numerous growth opportunities for manufacturers in the global atherectomy devices market. Critical limb ischemia was the leading cause of amputation in the U.S. in 2016, wherein an estimated 4,300,000 people in the country had critical limb ischemia and a part of this population was also diagnosed with PAD. The increasing number of patients suffering from gangrene is also estimated to boost the need for atherectomy devices worldwide. Growth in the volume of DAART procedures is expected to drive the unit sales of atherectomy devices over the study period. In July 2015, the U.S. Centers for Medicare & Medicaid Services (CMS) upgraded the pass-through compensation for Drug-Coated Balloons (DCBs). This is expected to drive the usage of DCBs in office-based labs and outpatient settings, and will contribute directly to growth in the volume of procedures that utilise atherectomy devices. The extensive outcomes from the one-year DEFINITIVE AR research study have established that a combination of directional atherectomy with anti-restenosis therapy (DAART) with drug-coated balloons increases patency in long lesions and lesions with severe calcifications. The availability of combination devices is not only limited to rotational atherectomy devices, but also other atherectomy devices. For instance, orbital and directional devices are also utilized during procedures that involve plaque modification stent placement. 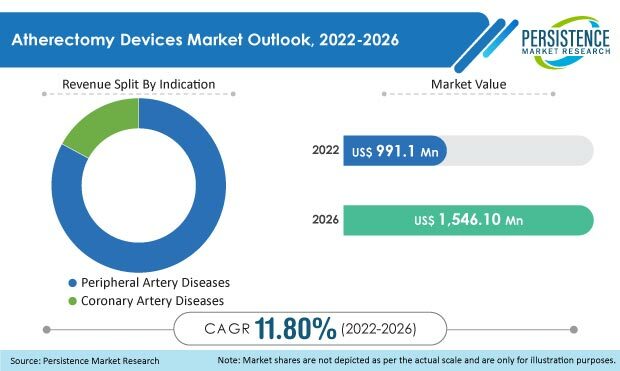 Increasing demand for vascular and coronary intervention owing to increasing cases of Peripheral Artery Diseases (PADs) and Coronary Artery Diseases (CADs) in the recent years is expected to drive the atherectomy devices market in the near future. Cases of diabetes, critical limb ischemia and cardiovascular diseases have increased in the recent past, even among younger patients. The increasing incidence of vascular diseases and disorders related to or caused by calcified peripheral and coronary artery, reduced blood flow and lower-limb amputation are estimated to fuel the demand for atherectomy devices over the forecast period and simultaneously projected to increase at a robust rate over the coming years. The competition section of the atherectomy devices market features the profiles of the key players operating in the market based on their shares, differential strategies, product offerings, marketing approach and company dashboard. Some of the key players operating in the atherectomy devices market include Boston Scientific Corporation, Avinger, Inc., Cardiovascular Systems, Inc., Medtronic and Royal Philips. Atherectomy devices are minimally invasive devices intend for the use in peripheral vascular intervention procedures. The principle of atherectomy is based on gaining substantial lumen in re-establishing the blood flow in the arteries by removing plaque and calcified lesions from the artery. PMR has conducted a research study on the atherectomy devices market for the forecast period 2018 to 2026. The atherectomy devices market report offers a comprehensive evaluation of the business opportunities available in the atherectomy devices market, along with insights on the consumption of atherectomy devices, incidence of diseases, awareness about critical limb ischemia and the competitive landscape of the atherectomy devices market. The report elaborates on the macro-economic factors influencing the dynamics of the atherectomy devices market and its futuristic potential. The report offers a comprehensive taxonomy of the atherectomy devices market based on the device type, indication, end user and region. The different atherectomy devices in the market include rotational atherectomy devices, directional atherectomy devices, orbital atherectomy devices and laser ablation atherectomy devices. These atherectomy devices are utilised is indications such as coronary artery diseases and peripheral artery diseases. Atherectomy devices are intended for end users such as hospitals, ambulatory surgical centres and Office-Based Labs (OBL). The atherectomy devices market has been analysed across the regions of North America, Latin America, Europe, Asia Pacific and MEA. What is the revenue potential of atherectomy devices across the regions of North America and Europe? Who are the key competitors and what are their portfolios in atherectomy devices market? What are major challenges influencing the growth of the atherectomy devices market? How is intervention from regulatory authorities impacting the growth of the atherectomy devices market? The atherectomy devices market has been estimated based on the supply-demand approach. The market was first calculated based on the consumption of atherectomy devices in different regions/countries. The volume growth of atherectomy devices was estimated based on the consumption of various types of atherectomy devices in the top 20 countries globally across five disease indications. Other qualitative factors analysed during the volume estimation of atherectomy devices include the level of awareness regarding Peripheral Artery Disease (PAD) and others. This information is further validated with rigorous primary research (which includes interviews, surveys, in-person interactions and the viewpoints of seasoned analysts) and secondary research (including verified paid sources, authentic trade journals and resourceful databases). The research study on the atherectomy devices market also includes the top trends and macro- as well as micro-economic factors shaping the atherectomy devices market. With this approach, the report on the atherectomy devices market estimates the industry attractiveness of every major segment of the atherectomy devices market over the forecast period.